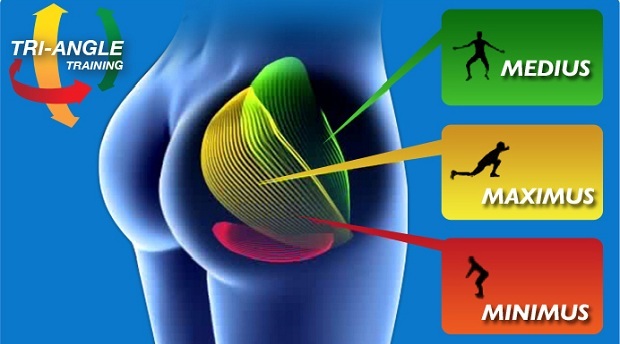 The following article offers you extremely efficient exercises that will help you restore and strengthen the gluteal muscles. -- Lay on your back with your knees bent and feet ﬂat on the ﬂoor in one line with the hips, knees, and ankles. -- Press your heel to the ﬂoor. Concentrate on the strength of the contraction at the buttocks. You should ﬁrst try this one side at a time and notice if there is any difference in strength. If you feel the calves working too much, lift the toes up and press only the heels to the ﬂoor. -- Lay in the same starting position as for the Heel Press. -- Begin engaging the buttocks as performed above in the Heel Press. Then bring the pubic bone to the sky and continue to roll up sequentially through your spine onto your shoulders. In order not to arch your lower back, make sure you are engaging your abdominals. -- Take care not to tense up your shoulders and neck here and carefully roll down to the starting position from the top of the spine. -- Stay tall as you send the leg that is up back down to the starting position. Repeat for as many reps as desired and then switch sides. -- Extra Progression (Optional): Try holding a kettle bell ﬁrmly overhead in the opposite arm of the leg that is lifting from back to up, keeping the arm in a neutral position throughout the exercise. The arm should make a straight line over the body. Bear in mind that the spine should remain in neutral position. -- Step out with one leg far enough that when you descend, your knees bend at 90 degree angles and do not move forward beyond the ankles. Keep your hands behind your head and your torso vertical. -- the back heel will lift and the back knee will lower straight down as you descend until it almost touches the ﬂoor. Make sure the hips remain on the same plane. Also make sure the knees remain in line with the hips and ankles and do not push inwards toward the midline of the body. -- press down through the front heel to re-engage the buttocks and to return to the starting position. Do as repetitions as desired and then switch sides. -- Flex at the hips by sending them straight behind you. This is the hip hinge, an important function for bending properly. As you continue to send the hips back in space, using this hip hinge, maintain the torso in one place so you eventually become parallel to the ﬂoor in a ﬂat back position rather than collapsing and rounding the spine. -- Press the hips forward to bring the torso back to the upright starting position in order to re-engage the buttocks and legs. -- Optional Progressions: Use a kettle bell or weighted bar maintained close to the body. Once you are able to perform cleanly, progress to the single leg deadlift. -- Extra Progression (Optional): Add torso rotation towards the front leg while maintaining a stable base. Make sure the arms move in opposition to the lower body just like in gait.